Patients with ESKD treated with hemodialysis (HD) are at substantially increased risk of life-threatening infections. A majority of bloodstream infections are related to vascular access, of which 70% are associated with the use of a central venous catheter (CVC) (1). Infections result in significant morbidity and are second only to cardiovascular diseases as cause of mortality in patients with ESKD. In addition to bacterial infections, patients on HD are also susceptible to viral infections, including hepatitis B (HBV), hepatitis C (HCV), HIV, and influenza. Outbreaks of HCV infections in HD facilities, which continue to occur with disturbing frequency, have often been due to poor infection control practices (2). In September of 2016, the Centers for Disease Control and Prevention (CDC) launched the Making Dialysis Safer for Patients Coalition to foster collaboration among dialysis organizations, physicians, public health officials, and patients. One of the top priorities for this coalition is prevention of bloodstream and other infections in patients on HD by increasing awareness among dialysis personnel and patients about ways to reduce infections. The Centers for Medicare and Medicaid Services also targets bloodstream infections as part of the ESKD Quality Incentive Program, and dialysis facilities are required to report all positive blood cultures to National Health Safety Network. This review emphasizes the importance of adherence to recommended infection control practices and highlights the important leadership role of nephrologists, especially medical directors, in preventing infections in HD facilities. Lapses in infection control practices, such as hand hygiene and environmental cleaning, have been associated with bloodstream infections and HCV outbreaks. The CDC strongly recommends several infection control procedures, including practice of hand hygiene, appropriate catheter care, use of antiseptic agents, checklists, and staff and patient education, all of which are vital to reducing infections (Figure 1). Dialysis personnel should be thoroughly trained in Standard Precautions and other infection control measures as outlined by the CDC and other organizations, such as the Association for Professionals in Infection Control and Epidemiology (3,4). Hand hygiene is an important measure for preventing vascular access–related and viral infections, and dialysis facilities should ensure the availability of easily accessible handwashing sinks and alcohol-based hand sanitizers. Opportunities for hand hygiene include (1) before touching a patient, (2) before aseptic procedures, (3) after body fluid exposure risk, (4) after touching a patient, and (5) after touching patient surroundings. One quality improvement project using an evidence-based intervention package and guidance from the CDC showed that staff training, hand hygiene, vascular access care audits, and staff feedback resulted in a significant reduction in access-related bloodstream infections (5). Use of checklists and monthly audits of hand hygiene practices as well as feedback to the caregivers are strongly recommended to improve adherence. Infection prevention requires a collaborative effort between the medical director, dialysis staff, and the patient and family. CDC, Centers for Disease Control and Prevention; QAPI, Quality Assurance and Performance Improvement. Although arteriovenous fistulas and grafts make up a majority of vascular accesses in HD facilities, approximately 19% of the prevalent HD population use CVCs. The CDC recommends a set of “Core Interventions for Bloodstream Infection Prevention” that address infection control measures specific to CVCs (4). Appropriate exit site skin cleansing with chlorhexidine plus alcohol, routine performance of catheter hub disinfection (“scrub the hub”), and applying antimicrobial ointment or chlorhexidine-impregnated dressing to the catheter exit site are essential steps in infection prevention (1). After the CVC caps are removed, the hubs should be scrubbed with an appropriate antiseptic (e.g., alcoholic chlorhexidine, povidone iodine, or 70% alcohol) every time that the catheter is accessed or disconnected. Antimicrobial barrier caps may also help to reduce catheter-related bloodstream infections and are widely used. Antibiotic lock solutions have shown lower rates of infections but are not recommended for prophylaxis due to concern for development of resistant organisms. The dialysis facility environment may be a source of infection transmission. Inadequately cleaned and disinfected dialysis stations, priming buckets, HD machines, effluent drain wall box, and other equipment have been implicated in transmission of pathogens in HD facilities (2,3). The CDC has specific recommendations and checklists for dialysis station disinfection, which should be performed only after the patient has left the HD unit. Careful use of single-dose and multidose medication vials is also essential in prevention of infection transmission. Single use should only be accessed once, and whenever possible, multidose vials should be dedicated to one patient. Medications and saline syringes should be prepared in a dedicated, clean, separate area in the dialysis unit and taken to individual stations by hand. A medication cart should not be used to take medications from station to station, because this has been associated with transmission of infections, especially HCV. Reuse of dialyzers has been associated with outbreaks of gram-negative bloodstream infections, and reuse facilities must ensure strict adherence to sterilization protocol to mitigate the risk of infection transmission. Annual immunization against influenza is recommended for patients with ESKD who are at increased risk of complications from influenza. All staff members, including physicians, are strongly encouraged to undergo annual immunization against influenza, and starting in the calendar year 2017, personnel influenza immunization is a Quality Incentive Program reporting measure. HBV transmission is becoming less common but continues to occur in the HD unit. Immunization against HBV is recommended for all patients with ESKD (ideally before starting HD) and all staff members (6). Hepatitis B surface antigen (HBsAg) and hepatitis B surface antibody (HBsAb) titers should be obtained before starting dialysis, and HBsAg titers should be checked monthly if HBsAb titers are not at the desired level. If patients are HBsAg positive, they should be dialyzed in an isolation room with dedicated equipment (6). It is recommended that a staff member be dedicated to the care of these patients for that shift, but this is cost prohibitive. Most facilities will ensure that the nearby dialysis stations are assigned to patients with high HBsAb titers, and the same staff member may care for them as well. For those patients who were immunized, HBsAb levels should be checked 1–2 months after the third dose and annually. A booster dose may be required if HBsAb levels decline to <10 mIU/ml (7). Baseline and routine (annual or biannual) HCV antibody screening is beneficial for early diagnosis and possible treatment, thus reducing transmission risk (6,8). Patient and family engagement is key in our attempt to target 100% infection control (Figure 1). Medical directors and dialysis nursing staff should invite patients in HD facilities to start a conversation about infection prevention (1,9). Patients and their family members should be encouraged to ask questions about infection prevention policies and practices used by the facility and speak up if infection control measures are not being practiced appropriately. Sample information that patients might ask about includes the dialysis center’s policies for prevention of HBV, HCV, and influenza; hand hygiene practices; medication safety; disinfection of dialysis stations; alternatives to using dialysis catheters; and whether the unit uses a new disposable dialyzer with each dialysis treatment (1). What is the role of the medical director and other nephrologists in preventing infections in the dialysis facilities? For too long, we have relinquished the responsibility of infection prevention to the dialysis staff. It is imperative that medical directors play a key role in developing and implementing infection control measures in the dialysis unit, because physician leadership is essential in preventing health care–associated infections. Medical directors should help review policies and practices dealing with hand hygiene, vascular access care, medication preparation, disinfection of environmental surfaces and dialysis equipment, and screening and immunization procedures, and they should address these issues during monthly quality assurance meetings (Figure 1) (10). During their dialysis rounds, they should serve as role models by practicing hand hygiene and speak up about infection control practices to the staff. Medical directors should actively collaborate with the nurse manager to perform staff audits of key infection control measures, such as appropriate precautions when accessing the HD catheter and cannulating the vascular access. Physicians should engage their patients in infection control measures and encourage patients to speak up and ask questions without fear of retaliation. Assuring antibiotic stewardship is also a major responsibility of the medical director. Colonization and infection by multidrug-resistant organisms are common among patients on HD, and antibiotic exposure is an independent risk factor for acquisition of multidrug-resistant gram-negative bacteria. Medical directors can minimize this risk by developing and implementing an antimicrobial stewardship program. Reducing the number of patients receiving antibiotics or reducing the duration of antimicrobial therapy may reduce both rates of colonization and environmental contamination by multidrug-resistant organisms. The incidence of serious infections among patients receiving maintenance HD remains unacceptably high. 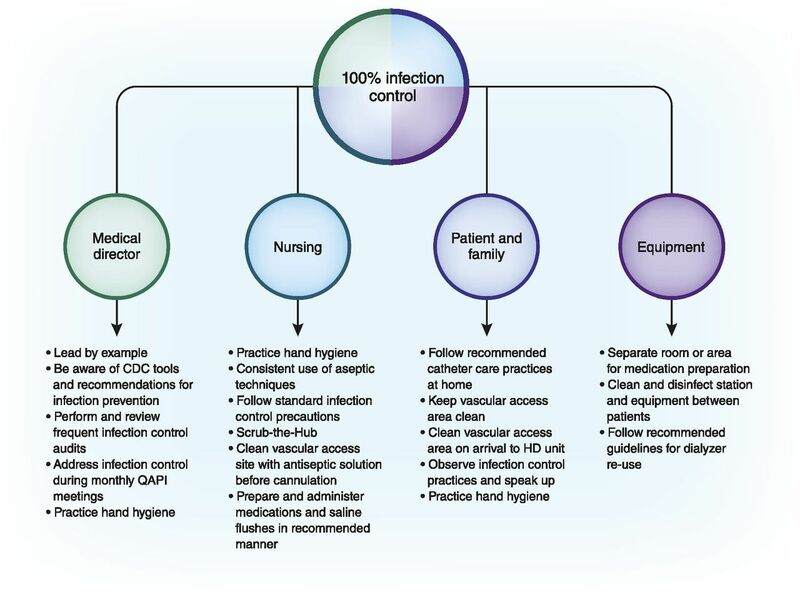 Acquisition of infections in HD facilities is often due to suboptimal infection control practices, and 100% utilization of recommended infection control guidelines is essential to prevent infections in this vulnerable population. Prevention efforts may require that HD organizations devote greater resources to ensure implementation of infection control practices. To lead these efforts successfully, medical directors and other nephrologists must understand and champion the CDC infection control practice guidelines. When nephrologists lead by example and collaborate closely with nursing management and staff, we may achieve our target of zero preventable infections and reduce infection-related morbidity and mortality. A.V. and J.M.B. are members and committee chairs of the American Society of Nephrology’s Nephrologists Transforming Dialysis Safety project, which is funded by the Centers for Disease Control and Prevention. A.V. is a speaker for Sanofi and a member of the scientific advisory board for NxStage. In the last 2 years, J.M.B. has been a consultant to Diversey Care, GOJO Industries, PDI, and Sodexo. J.M.B. has received research funding and travel support from Diversey Care and GOJO Industries. See related articles, “Systems Thinking and Leadership: How Nephrologists Can Transform Dialysis Safety to Prevent Infections,” “Urgent: Stop Preventable Infections Now,” “Addressing the Problem of Multidrug-Resistant Organisms in Dialysis,” and “What We Learned from Ebola: Preparing Dialysis Units for the Next Outbreak,” on pages 655–662, 663–665, 666–668 and 669–670, respectively.